JOIN TECHHIRE OAKLAND FOR AN INTIMATE WORKSHOP ON EXPERIENCE ENGINEERING AT GITHUB. COULDN't MAKE TWILIO'S OCTOBER DEVELOPER CONFERENCE? NO SWEAT. TECHHIRE OAKLAND IS bringing TWILIO TO THE EAST BAY. 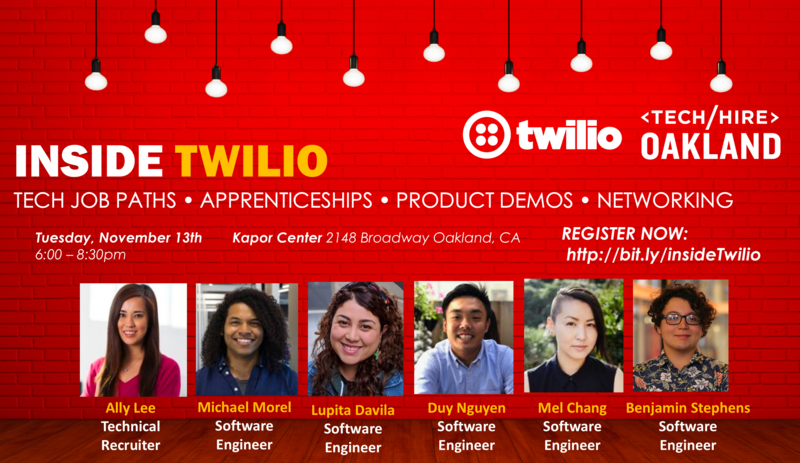 2) Job PaTHS: APPLICATIONS WILL SOON BE OPEN FOR TWILIO's paid TECH apprenticeship program, "HATCH"